William S. Farish’s homebred Code of Honor earned 50 points on the Road to the Kentucky Derby following his game tally in the Fountain of Youth Stakes (G2) at Gulfstream Park on Saturday. The sophomore colt now sits in second with 54 total points following his triumph at 9-1 odds. Racing near midpack early beneath John Velazquez, the Shug McGaughey trainee moved into third at the top of the lane and was in second nearing midstretch with momentum. The son of Noble Mission powered to the lead inside the final furlong and held a hard-charging Bourbon War at bay late to earn his initial graded stakes win, clocking 1 1/16 miles in 1:43.85 in the process. Code of Honor debuted at Saratoga in the summer and led at every call en route to a 1 1/2-length tally going six furlongs. Returning six weeks later at Belmont Park, the chestnut colt overcame a bad stumble at the break to rally for a fine second-place finish in the Champagne Stakes (G1). 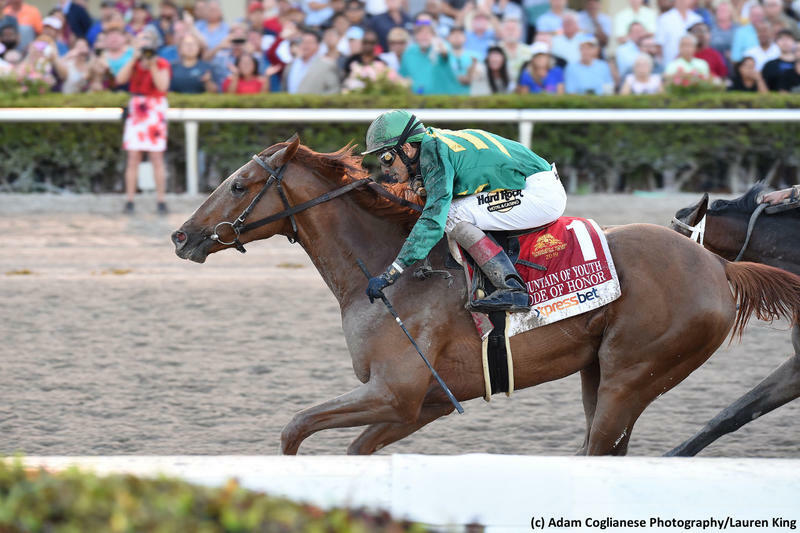 The Kentucky-bred kicked off his much-anticipated three-year-old campaign in the Mucho Macho Man Stakes at Gulfstream, but he never fired in running fourth as the 4-5 choice. He showed marked improvement on Saturday when rallying off a swift pace to earn graded glory. Code of Honor is the first stakes winner out of the Grade-3 winning Dixie Union mare Reunited. She herself is a half-sister to a pair of stakes winners; the Summer Squall mare Wind Tunnel and Dixieland Band colt Deal Breaker. The winner is bred to handle a route of ground and is likely to progress on the Road to the Kentucky Derby as a serious Triple Crown contender. He has earned respectable BRIS Speed figures of 93-95-91-95 to date with room for improvement as he continues to develop. Code of Honor has shown versatility, with gate speed as well as a stout turn of foot. The colt is in the hands of a patient conditioner who knows how to point a horse towards a big race. Code of Honor appears to have all the tools to be an impactful three-year-old throughout the spring.